My 65 has the clamps for the jack bungee cord riveted directly to the floor. 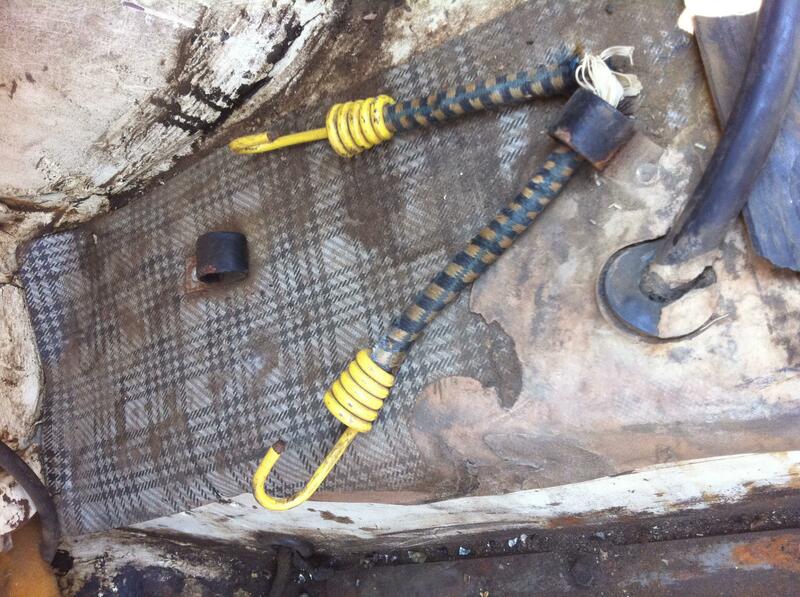 I have seen pictures of restored cars that show the clamps riveted through the trunk mat. What is considered correct? On a related note is the number on the bottom of the mat a date code? Can any one decipher "55 C922"? Most all originals that I have seen, including 5S162, have them riveted on top of the trunk mat. +1. riveted through trunk mat is most typical. Does one know where I can buy the bungee or the clamps? The clamps are the same ones used for the front to rear battery cable attaching to the chassis. Brant should have them. So I'm assuming there are 2? One on the top, one on the bottom? How far apart should they be and any idea of the cord? Look closely at the picture. You can see both ends of the bungee cord. There is only one clamp. Seems I recall a discussion on the old forum where there were a few cars with two clamps but most only had one. p.s. : We ascertained that the early cars had no clamp/s. So it was pointed out by Howard Pardee that the early Cars, had trunk mounted batteries and therefore no clamp as it would have gotten in the way! Duh! Therefore the jack and handle should be in the wheel well? The clamps mounted in one of the typical locations with the jack stowed do not interfere with a trunk mount battery. Just to be clear I agree some early rear battery cars did not have the clips riveted to the floor to hold the jack and the handle/handles. I don't believe all were done that way without . O.K. Brant...Then what's going on in the picture? I clearly see two bungee cord ends around the one clamp. Since we don't have the benefit of going back to the old forum, we only have our memories. I know mine is failing but I do seem to remember the discussion that some had only one clamp and some had two. Look at reply #8 . The clamp goes around and holds the bungee cord. The cord wraps around the jack and is secured to the clamp farthest forward. Brant's picture appears to be the same. Any indea when you might have some more Brant? I'll take a set for sure.